In trying to absolve themselves of their litany of environmental sins, some golf courses have started using treated effluent water to maintain their unnatural lushness. 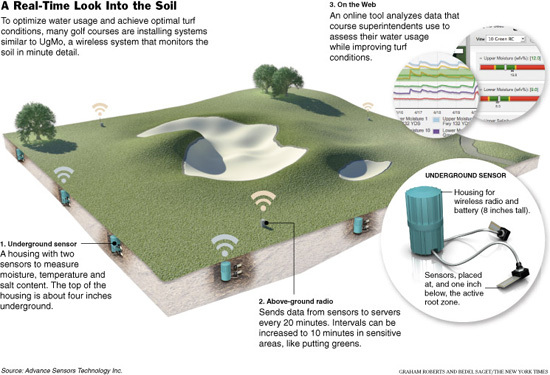 Additionally, those that can afford it have been experimenting with “subterranean wireless sensors” to better manage and monitor their water use. In terms of water conservation, they're turning out to be quite a success. One club superintendent is quoted as saying that they have cut the amount of water they use in half. The implication here, of course, is that giving high-tech intelligence to other landscapes — to athletic fields, farms, parks and home gardens — could mean a reduction in resource consumption there as well. Now if only some of these golf clubs try to absolve themselves of their racist, sexist and other socio-exclusionary policies.